Back in Fall 2016, Alex Fogarty of Graphic Communications(GCOM) and David Kramar of the Center for Geospatial Studies started the development of a mobile application to assist local homeless organizations in their survey and count of unsheltered homeless individuals in Moorhead. These surveys occur yearly, and nationwide in January. The goal of the app project is to help create a more efficient and modern collection system, one that would replace the traditional pen and paper collection method. Using hand-held devices such as iPads, mobile phones, or tablets, data is immediately entered into a web-based geospatial database – creating actionable data ready for analysis on many levels. Coordinated through the Department of Housing and Urban Development (HUD), the nationwide, annual PIT surveys have staff and volunteers manually counting and interviewing sheltered and unsheltered homeless individuals and families. The surveys Fogarty and Kramar created using ESRI-based GIS technology, used the traditional survey information, yet it was integrated into an ESRI geoform development tool. The geoform facilitates easier data entry, location collection tech- niques, and data management in order to assist the counts. The data collection occurs nationwide, including the 10 counties in Minnesota’s West Central Continuum of Care (COC). The goal for the 2018 count is to distribute and use the app in this West Central region under the supervision and coordination of Carla Solem, the region’s coordinator. 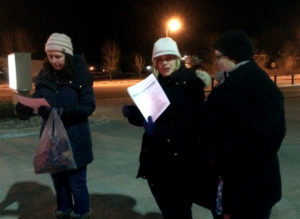 In January, Fogarty and two volunteers – GCOM student Jayce Branden and Concordia Sociology Professor Mallary Allen — accompanied 10 trained volunteers on the Moorhead PIT count. They met at 3am outside of Churches United Homeless shelter and broke up into teams – each team had a member using the app to mirror the data collection of the paper collection. Only one team encountered homeless individuals, but it was enough to provide a test of the app, and ideas for enhancements for the app that were not originally considered – such as adding geospatial information for the volunteers to find locations that are known to be occupied by homeless individuals. Minor user experience “bugs” that were revealed will also be fixed before it rolls out to wider use. The process of building a GIS web application has been made easier in recent years by mapping services that are available for subscription. 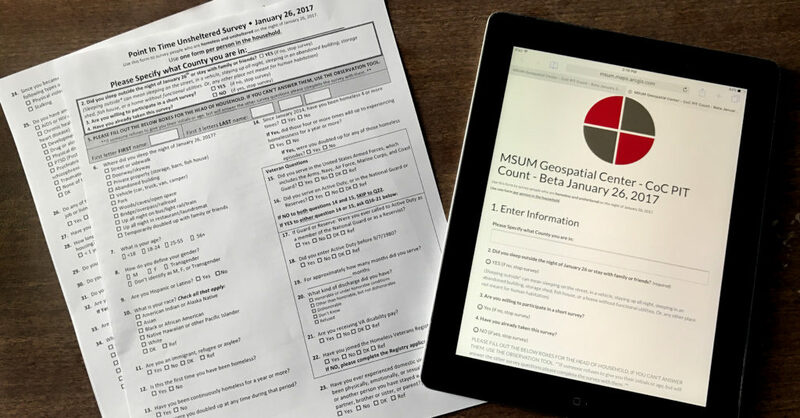 MSUM’s Center for Geospatial studies uses ArcGIS Online (AGOL), an ESRI provided service, to build maps and harness the power of online GIS applications technology. For the first phase of the project, a geoform template was used to recreate the traditional paper forms. The outer facing form then needs to rely on a “feature service” layer to capture the input data, and store it in a database for analysis and distribution. The feature service is built with a locally installed instance of ESRI’s flagship program ArcGIS. This software is used to develop the geodatabase that holds the feature class, including the domains and sub-domains that were required for the application to run. The geodatabase is then shared as an editable feature class in AGOL, and linked to the online form. During collection, data can be collected offline, and then sent to the database when reconnected to wifi. MSUM has its own servers to store the data, which will then be shared with the CoC and HUD. Over the summer the Center for Geospatial Studies and the Interdisciplinary Center for Diversity and Social Justice made plans to collaborate with the mapping volunteer effort moving forward, and it will be a feature of November’s GIS Day events. Work on the application has continued and will move into final stages in the Fall of 2017 to be ready for the count in January 2018. The goal for the 2018 count is to equip each team in the West Central region with collection devices and provide volunteers to help with the count. The team will further assist the CoC with data storage and analysis to potentially help homeless service providers in their work.